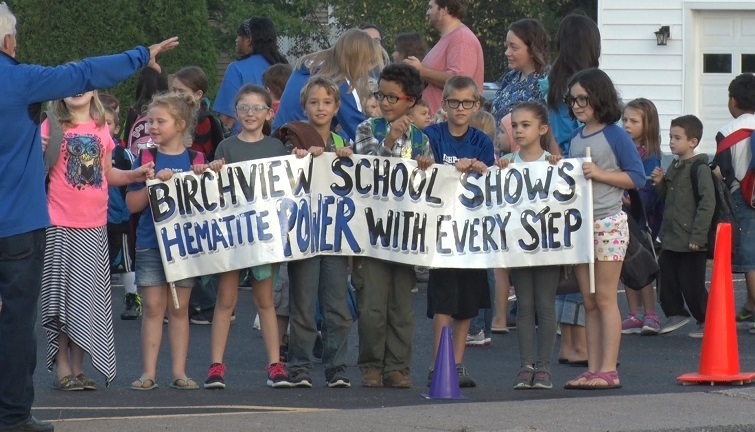 ISHPEMING — For the first day of fall, the weather was absolutely perfect Friday morning as students at Birchview Elementary gathered to walk to school. Students gathered at Saint Joseph’s Church in Ishpeming and walked to school together a little after 8:00 a.m. The elementary students took part in International Walk to School Day, which encourages kids to take part in activities related to physical fitness and promotes safety while walking to school. “We live right in town. Our school district is basically consists in the City of Ishpeming, so a lot of our students walk on the streets everyday and it’s just promoting street safety,” said walk organizer Sarah Carson. Ishpeming High School athletes, plus the police and fire departments all took part in the walk. Once they arrived at school, the kids each received a certificate for participating in the event.